The first day of competition completed at the Michiana Raceway Park in North Liberty, Indiana for the second stop of the 2014 United States Pro Kart Series. The weekend, presented by Verde Speed Resources and freem USA, began with the question of when the rain would fall. Friday’s threat passed after early morning storms rolled through, allowing for a full day of practice. The chance however moved over to Saturday with the day starting out very hazy and later turning into bright sunshine for the main events. Big storms threatened to hit the area but broke up before moving across the facility to allow all the races and the Saturday evening dinner to go on without interruption. On-track, there was no clear-cut driver to beat in any of the categories as the fields were close in each of the eight divisions. Only one driver was able to sweep the day, still no perfect scores were recorded. The Pro divisions welcomed first-time winners to the top of the podium with Praga North America’s Michael Geringer coming up big in the Leopard division and Mike Doty Racing’s Brandon Jarsocrak stomping the field in Yamaha. Four other drivers also took home their first victories of the season. The 34-driver field was split into two qualifying groups, with each allowed five minute to post the fast laps. After both groups were completed, ART GP America driver TJ Koyen was the fastest of them all. A 41.285-second lap secured the pole position by 21 thousandths of a second over Praga North America driver Andrick Zeen. Armin Cavkusic (FA Kart) was third with Brandon Jarsocrak (Deadly Kart) and Michael Geringer (Praga) completing the fast five. The top six, including Andrew Bujdoso (PCR) were within a tenth of a second. Koyen took advantage of the pole position to lead all 10 laps of the opening heat race. He got away early and held on for a three tenths advantage over Geringer. Zeen was shuffled back outside the top-five early, but fought his way up to third over a charging Derek Dignan (FA Kart) who started 16th. Anthony Granata (Tony Kart) ended up fifth. The second heat looked to be a similar race with Koyen breaking away from the field with Cavkusic on his bumper. Cavkusic struck early, taking the lead from the top qualifier. 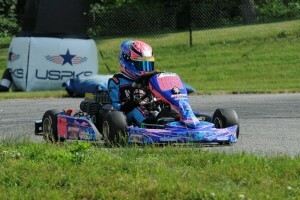 The Franklin Motorsports/FA Kart driver led the remainder of the 10-lap race to score his first series win. Finlayson performed his best in heat two as the Koene USA driver worked by Koyen for the second spot. Jarsocrak, after breaking his front end in the opening circuit of heat two, drove to fourth after AJ Myers (PCR) and Zeen dropped down the order following contact in turn nine. 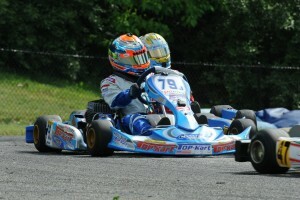 Mick Gabriel, in his ART GP kart debut weekend, drove up to fifth from the 13th position. The heat race results put Koyen on the pole position with Geringer on the outside of row one. Contact mid-pack in turn one after the green flag waved involved Zeen, taking him out of the race early after rebuilding his Praga chassis before the race. Out front, Koyen paced the field with Geringer, Cavkusic and Gabriel on his tail. Koyen led the way as they shuffled up behind him until lap seven when jumping the turn 10 curb the chain popped off his driveline, ending another chance for victory. That gave Geringer the lead with Finlayson now up into the second spot after starting ninth. 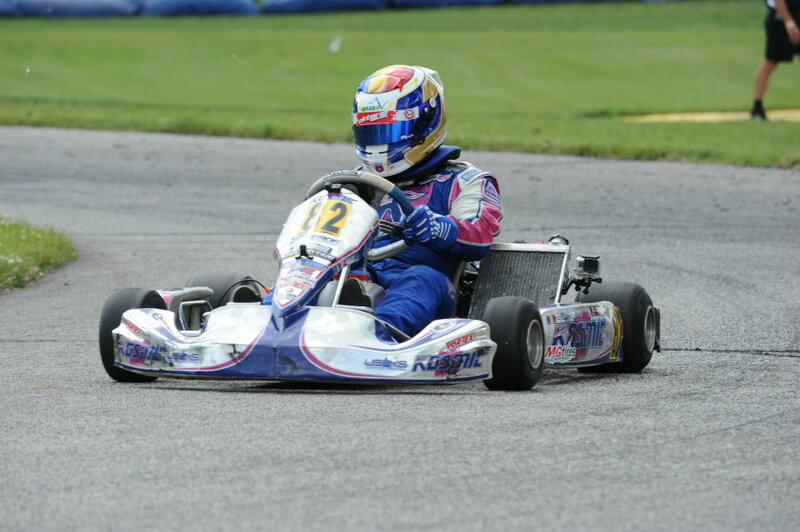 He seemed to have the quickest kart at the midway point, putting on the pressure for the lead. That was until he suffered a deflating left rear tire. He held on and tried to fight on but eventually retired. 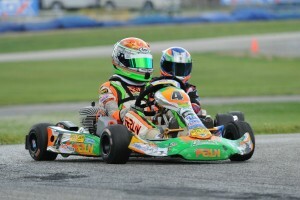 That promoted a charging Darin Marcus up to the second spot aboard his Franklin Motorsport Tony Kart. He reeled in Geringer slightly but ran out of time to make any advances for the lead. Geringer led the remaining laps to secure his first USPKS victory, and first Leopard Pro win for the Praga North America team. With his win, he was awarded a ticket into the drawing for the IAME International Final ticket. 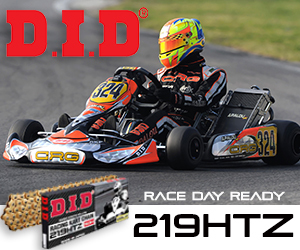 Marcus drove to the finish in the second position, but was to finish behind the #22 of Sage Karam (iKart). That promoted Gabriel to the runner-up position on the podium with a solid ART GP America debut. Another stellar debut was Jarsocrak’s first time aboard the Deadly Kart from Australia. The latest brand from multi-time Australian champion David Sera, Jarsocrak was among the quickest drivers on the course. Starting 19th, the Senior rookie avoided the issues that plagued many others to end up third on the podium. 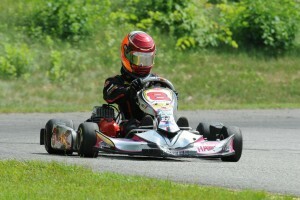 Anthony Granata (Tony Kart) started fifth and held his own to earn his best USPKS result with a fourth place drive. Completing the podium was defending champion Kyle Kalish (Merlin). The Franklin Motorsports driver overcame a DNF from contact in Heat #1, and started the main in 23rd. The fastest driver on the course, he knifed his way up to fifth. 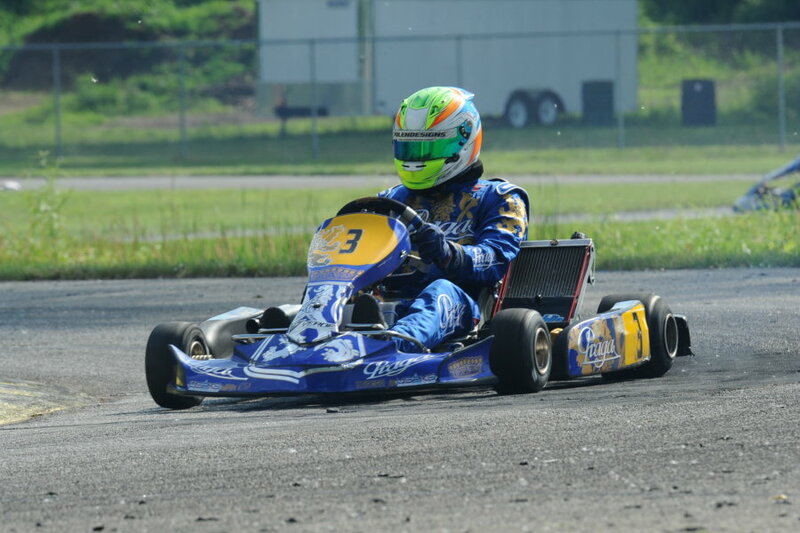 Championship leader Roger Ralston Jr. (FA Kart) was improving throughout the day, but was involved in the opening turn one wreck that help to take out Zeen. He continued but cut the track early on. He crossed the checkered flag in the seventh spot, but was dropped back to the 26th position in the final tally. Jacob Knueven (Arrow) overcame a flat tire and wreck in Heat #2, climbing from 20th on the grid to sixth. Indy 500 rookie Sage Karam started the day on the outside looking in, but fought his way forward to a seventh place result. 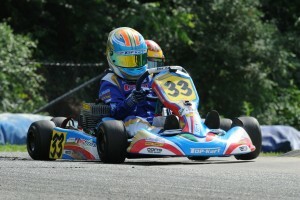 His iKart teammate Mark Boos was ninth behind Marcus with Derek Dignan (FA Kart) in 10th. Another stout field of 20 drivers filled up the Yamaha Pro division, with a number of contenders ready to fight for victory on the opening day in South Bend. KartSport North America driver Derek Dignan (FA Kart) locked up his second pole position of the season with a fast time of 44.294, edging out Darin Marcus (Merlin) by just 52 thousandths of a second. Veteran Tony Jump (Arrow) was third with Round One winner Camden Speth (FA Kart) and Adam Crepin (Merlin) making up the fast five. Point leader Brandon Jarsocrak (Haase) was sixth in the order. The driver to watch in the opening heat race was point leader Jarsocrak. The top three fought for the lead early on after establishing a gap on the rest of the field. Jarsocrak’s Haase kart came on late, posting laps about two tenths of a second quicker than anyone on the track. He caught leaders and quickly disposed of them, taking over the lead and scoring the win in the eight lap battle. Marcus held off Jump for second with Dignan falling back until a rear bumper detached and was forced to pull off early. That promoted Dakota Pesek (Top Kart) who drove up from 11th to fourth with Adam Crepin (Merlin) in fifth. Another great drive was put in by Collin Griffin as the Tony Kart privateer was unable to make a lap in qualifying, coming from 20th on the grid to end up sixth. It was a three driver breakaway with Dignan and Marcus locking up at the front. Jump spun on the opening lap, dropping to the tail of the field with point leader Jarsocrak once again moving up the order and into the lead pack. Jarsocrak eventually worked his way into the lead by lap eight of the 10-lap race, bringing Marcus with him to put Dignan back to third. Jarsocrak drove to the win to lock up the pole position for the main event. Dignan worked by Marcus for second on the final lap. The fight for fourth went down to the wire with Killian Keaveny (Top Kart) slipping by at turn nine, moving Kyle Kuntze (ART GP) to fifth. Jarsocrak made it look nice and easy for the main event win, scoring his first series victory. From the pole position, he was followed by fellow championship contender Pesek with Marcus back outside the top-five after starting on the front row. The top four, including Kuntze and Keaveny ran nose to tail until the ART GP driving began fighting for position. The shuffling continued which allowed Jarsocrak to pull away little by little. Marcus was able to fight his way into the top-five, and worked himself up to the second spot. Kuntze would not reach the halfway point as he retired with a loose axle and was forced to pull off. Dignan was the next driver on the move, with the fast laps of the race. Starting 11th, he was into the top-five and eventually found himself in the third position. They would run that way to the checkered flag with Jarsocrak scoring the victory for Mike Doty Racing over Marcus and Dignan. The fight at the end was for fourth, with Jump able to move around Pesek for the spot. Podium positions changed with Marcus handed a penalty for early contact with Jacob McWhirter (Tony Kart). That dropped him back behind in the 13th spot, moving Jump to third and Pesek fourth. Privateer Griffin was placed in the fifth spot on the podium. Laurentiu Mardan (Kosmic) set the pace for the field in the qualifying, posting a 42.840-second lap. Cristian Vomir (Kosmic) was second with Francois Brun-Wibaux (PCR) third. Mardan drove to the opening heat race win, with Vomir holding the second spot. Brun-Wibaux got a great jump to begin heat two, and darted into the lead. He drove on to score the race win over Mardan and Vomir. The final however was all Mardan, who led all 16 laps for his first victory of the season. Vomir was second with Brun-Wibaux third. Championship leader David Malukas (Top Kart) started out Round Three with a solid qualifying session, earning the pole position. His time of 41.492 was best as Happy Hour fast driver Braden Eves (Tony Kart) was second. 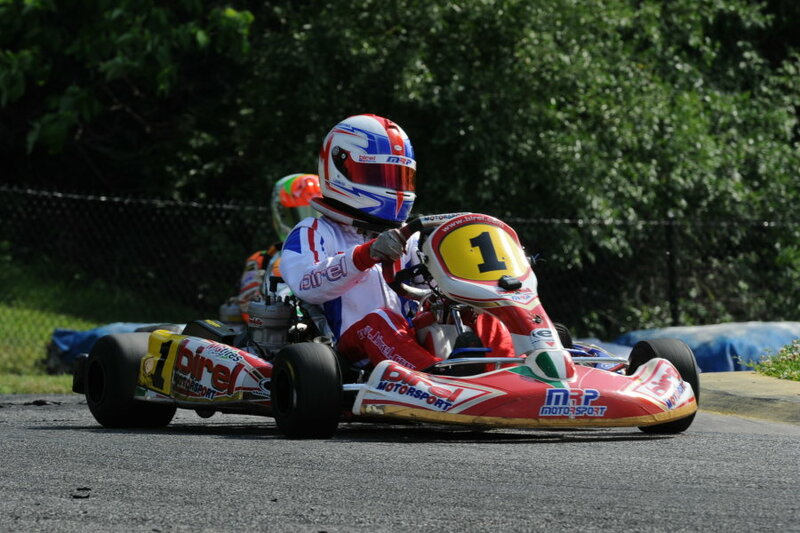 Mike McAndrews (Birel) was third in order with Alexander Kardashian (Top Kart) fourth in his series debut. Canadian Roman DeAngelis (Tony Kart) completed the fast five. McAndrews was able to climb his way to the front and score the win in Heat #1. Malukas led the way early on with McAndrews jumping up to second. The two stayed static until McAndrews found his way by for the lead. Malukas then had to go in defensive mode with Eves putting on the pressure. In the final circuit, Eves took the spot and held it to the checkered flag to finish behind McAndrews. Malukas was third with DeAngelis holding fourth ahead of Zach Holden (Top Kart). Eves was able to double up in the heat races, scoring the second race win. Malukas paced the field until lap six when Eves struck, taking over the top spot. Malukas then came under pressure from the other two drivers in the lead pack. Eves went on to win by a half second, with DeAngelis and McAndrews working past Malukas for position. Matt Solarczyk (Birel) drove to the fifth place result, starting seventh. Eves earned the pole position for the main event with McAndrews lined up on the outside of the front row. McAndrews got the jump as the green flag waved, and settled in as the leader. 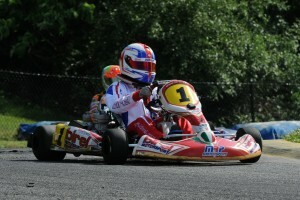 The race was halted by lap seven when Michael Rutter (Tony Kart) went off into the turn one crash pillows and fence. He walked away from the incident, and the race continued. McAndrews restarted the race and held the lead with Eves putting on the pressure. The two were nearly identical, and Eves was unable to make a charge for the win. In the end, McAndrews scored his first victory of the season with Eves an impressive runner-up. Anthony Gangi Jr. (Tony Kart) was quite all day, starting eighth and after the restart, found more speed. Into the fourth spot once the race went back to green, he ran down DeAngelis and took over the third spot on lap 15, holding it to the checkered flag. The Canadian ended up fourth with Malukas fighting back to fifth after getting shuffled out. Local knowledge helped during qualifying for the Yamaha Junior category. Becker Reardon (Tony Kart) has been fast at each USPKS circuit, but the North Liberty, Indiana driver set the pace for the category to earn his first pole position in the series. A 43.644-second lap was quickest, edging out three others by less then a tenth of a second. Championship leader David Malukas (Top Kart) was second with his Top Kart USA teammate Zach Holden in third and Simon Sikes (FA Kart), making his Junior debut in fourth. Brandon Lemke (Merlin) completed the fast five. Holden was able to break away from the field and score the win in Heat #1. A three driver battled formed up front with Reardon leading the way. Holden took over the lead after a couple of circuits, and with the fight for second heating up, he pulled out to a 1.2-second advantage. Malukas won the battle for the runner-up spot, with Reardon third, Lemke fourth and Canadian Roman DeAngelis (Tony Kart) up to fifth, dropping Sikes to sixth. The second heat race was a Top Kart at the front, this time with Malukas at the front. Reardon held the point from the pole position until Malukas worked past for the spot on lap five. The fight for second heated up in the closing laps, allowing Malukas to cruise to a 1.2-second win. Reardon and Lemke went back and forth for position, making contact on the final circuit in turn eight. Reardon held off Holden at the stripe but was place behind Lemke for the contact. That put Holden to second, Lemke third and Reardon fourth. DeAngelis held off Sikes for the fifth position once again. The main event was set up to for a great show, and Reardon did just that. The Top Kart of Malukas and Holden hooked up once again, starting on the front row and were setting the pace. Reardon stayed close early, and rather than holding back, made his move quickly. By the end of lap three, Reardon was into the lead. Malukas slotted into the second spot with Holden holding as wingman. They ran that way the entire time, with Malukas putting on the pressure in the closing laps. Reardon never made a wrong move or put a tire in the wrong spot, holding on to take the checkered flag first. What could have been his first national victory was taken away when his engine did not pass a CC test. That gave the win to Malukas with Holden up to third. Lemke was trying to reel in the leaders, but came short in the end to finish third. DeAngelis posted the fast lap of the race and ended up fourth in his first Yamaha race with USPKS, while Ryan Weyer (Merlin) advanced up to the fifth spot after starting 11th. The 21 driver Mini Rok Cadet field hit the track first for the day’s action, with the later laps in the five minute session deciding the fast laps. Alex Bertagnoli (Merlin) earned his first category pole position with a 45.343-second lap. He cleared championship leader Dylan Tavella (Tony Kart) by just one-tenth of a second, with Devin Boutot (Tony Kart), Austin Schaff (Merlin) and John Paul Southern Jr. (PCR) completing the fast five. Bertagnoli used the pole position to pull away to the win in Heat #1. Out front, he led all eight laps for the win with Tavella holding strong in second. Southern advanced up to the third position with Sam Mayer (Merlin) following through to sixth with Schaff dropping one position to fifth. Another win in Heat #2 for Bertagnoli helped the Franklin Motorsports driver the pole position for the main event. The top qualifier was pressured all race long with Schaff coming in second and Tavella in third. 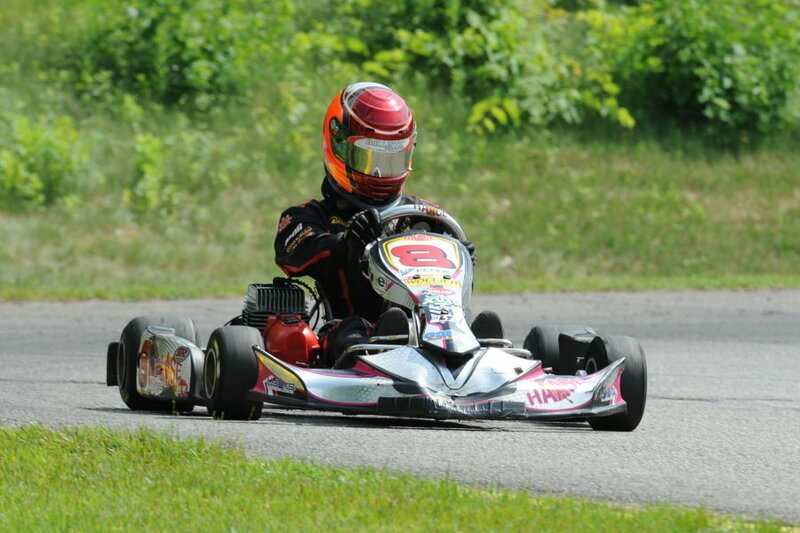 Alex Verhagen (FA Kart) came up fro eighth to fourth with Mayer placing fifth once again. Southern was a DNS for the heat race, costing him valuable points toward the grid position for the main event. Two wins and fast time in qualifying gave Bertagnoli the pole position for the main event. He saw Schaff and Tavella slot in behind him. Bertagnoli held a slight advantage until they began fighting for the second spot. Verhagen was on the move and disposed of Tavella, joining the fight for the top-three. Schaff stayed locked on Bertagnoli’s bumper, but no moves were made. Bertagnoli held on for his first USPKS victory, with Schaff second and Verhagen third. Southern, who started 12th after missing the second heat race, was the quickest driver on the course. He caught Tavella and the two fought for the fourth spot to the very end. At the line, Southern was fourth with Tavella in the fifth spot. The pole position was decided in the final few drivers crossing the line at the checkered flag. Local driver Aidan Harrington (Birel) jumped to the top of the order with his final circuit, posting a 46.432-second lap. John Paul Southern Jr. (PCR) fell down to second with Austin Schaff (Merlin). 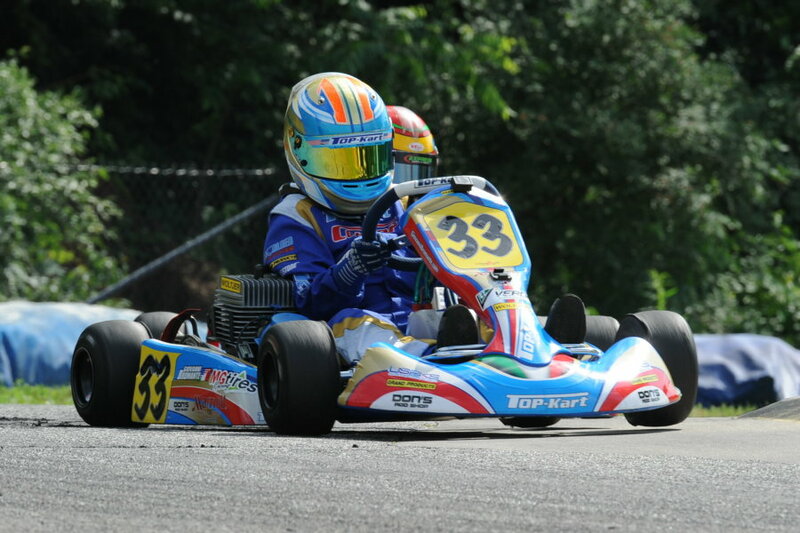 Point leader Dylan Tavella (Tony Kart) was fourth with Giovanni Bromante (Top Kart) fifth in his first series race of the season. Harrington led the field to the green flag for Heat #1, but quickly found himself hounded by two others behind him. Schaff was there and took over the lead, and led for much of the eight lap event until the final circuit when a charging Bromante took over the spot with a move in turn eight. At the line, it was Bromante with the win over Schaff with Southern right there in third. Harrington ended up fifth, one spot behind Alex Bertagnoli (Merlin). It was a great race in the second heat with a four driver battle for the win. Harrington was joined by Southern, Schaff and Tavella at the front. Southern appeared to have the race in hand as they took the white flag. Schaff however was able shoot inside at turn one as Southern fell back to fourth halfway through the lap. Schaff held on to take the win over Harrington with Southern back around Tavella for third in the final corners. Sam Mayer (Merlin) led a group of drivers to place fifth, coming up from ninth. Schaff and Bromante filled out the front row with their heat wins, leading the field to the green flag for their 16-lap event. The top two swapped the lead a few times before Schaff took over the lead. Bromante and Bertagnoli settled in behind, but the attention turned to Southern. Starting 14th after penalty put him at the back of the results in heat two, was charging forward. By lap 14, he was into the top-five and gaining ground on the three leaders. The white flag was displayed with Schaff driving a defensive line into turn one. Bertagnoli criss-crossed on the exit and held the inside, coming out of the esses with the lead. Schaff drove off the course and allowed Bromante and Southern by. Bromante closed up on Bertagnoli, and they drag raced to the line. By 82-thousandths of a second, Bertagnoli crossed the line first. Officials however moved the provisional winner behind Schaff for contact in the esses. That moved Bromante to the top step of the podium for his first series victory. Southern was credited with second, moving Schaff to third and Bertagnoli back to fourth. Tavella completed the top five for his second podium trip of the day. Round One winner Tyler Maxson (Tony Kart) began the first day of racing in South Bend with his first pole position of the season. A 47.976-second lap cleared the field by two tenths of a second. Aiden Lindley (Birel), making his 2014 debut, was second with Ryan Detlor (Praga), point leader Luca Mars (Praga) and Chester Brimer (CRG) making up the fast five in the 14-driver field. The top two drivers in the standings decided the win in the opening heat race for the Rookie division. Pole sitter Maxson was joined by Mars at the front, as the two went back and forth for the lead. After eight laps, it was Mars earning the checkered flag for the win with Maxson third. Detlor and Gunnar Bischoff (Haase) were close to the leaders at the end with Lindley back to fifth. A four driver battle for the win took place in Heat #2. Lindley was leading the train of drivers to the white flag, but began a defensive line heading into turn one. Detlor took advantage to criss-cross the leader on the exit of the corner, jumping into the lead going into the esses. He would hold on to the line to earn his first heat race win, with Lindley, Maxson and Mars right there. Donald Whorton II (Tony Kart) finished the race fifth with Bischoff spinning in the late stages of the race while racing for a top-five result. Detlor and Maxson made up the front row for the main event following the results of the two heat races. Maxson secured the lead through the opening circuit and set the pace until lap four when Mars took over the top spot. From there, it was all Mars as he was able to drive away, leading the remaining circuits for his second straight victory. Detlor fought off Maxson for the second spot on the podium with Whorton winning the fight for fourth ahead of Bischoff.